Allentown, PA (February 17, 2017) - Adams Outdoor Lehigh Valley recently built a 14’ by 48’ digital billboard on the New Jersey Turnpike. 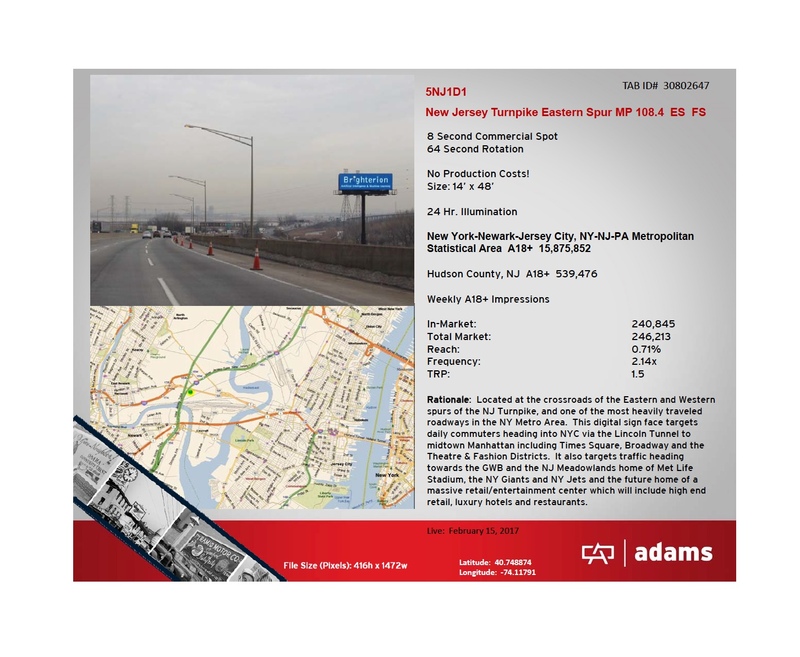 The billboard is located at the crossroads of the eastern and western spurs of the NJ Turnpike, also one of the most heavily traveled roadways in the New York, Newark, Jersey City metropolitan area. This digital sign targets over 539,476 (adult 18+) weekly commuters heading into New York City via the Lincoln Tunnel to midtown Manhattan, including Times Square, Broadway, the Theatre District, and the Fashion District. 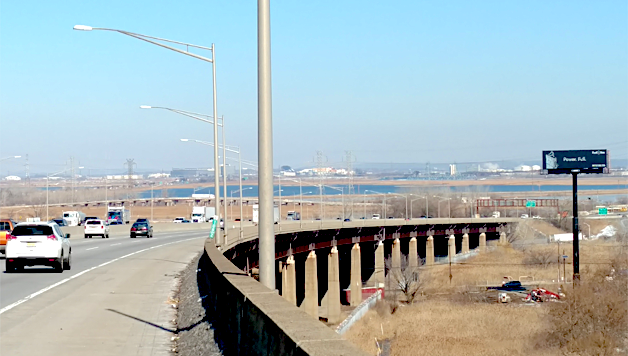 It also targets traffic heading towards the George Washington Bridge and the New Jersey Meadowlands, home of Met Life Stadium, where the NY Giants and NY Jets play. Meadowlands is also the future home of a massive retail and entertainment center which will include high-end retail, luxury hotels, and restaurants. The new digital is ready to host advertisers and requires no production fees for creative or dynamic content. Adams Outdoor acquired Fairway Outdoor in January 2015 to form the 4th largest out-of-home advertising organization based in the United States. Adams + Fairway serves over 21 states, 34 markets, and owns 29,000+ billboards. Over 460 of those billboards are part of the national digital signage network that Adams + Fairway continues to aggressively expand. Adams + Fairway recently launched Outdoor Extended which now expands its ad serving into online and mobile formats. For more information, visit www.adamsoutdoor.com and/or www.fairwayoutdoor.com.